Your investor-entrepreneur relationship is important. After all, you may be living with it every day for years to come. Entrepreneurs looking for investors often feel they can't be choosy. If they need money, their reasoning goes, they have no business turning away anyone who has it. 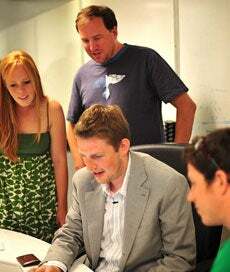 David Cohen (in blue) with Wordpress founder Matt Mullenweg (center) and members of Foodzie, a TechStars company. Angel investor David Cohen, co-founder of the Boulder, Colo., startup accelerator TechStars, says this approach is wrong. In the new book Do More Faster, authored with TechStars co-founder Brad Feld, Cohen says that the right investor-entrepreneur relationship is important. Choose an investor who doesn't have your interests at heart or who is out of sync with what you're trying to build, and you may be living with a bad relationship every day for several years. "As an investor, I want you to be selective about everyone -- vendors, customers. If I'm not adding value to what you're doing, don't talk to me," he says. Cohen spoke with Entrepreneur.com about how to find and size up angel investors. Here are excerpts from that conversation. Entrepreneur: What should an entrepreneur want to know about a prospective investor? Cohen: We're evaluating each other in a personal relationship, first and foremost. So the entrepreneur wants to ask: Can I talk to the last three CEOs you backed? Also, how do you support the companies you back, beyond providing money? I like the questions: What is your relevant experience around my company? What excites you about my company? What do you know about the world I'm living in? A lot of entrepreneurs will ask questions around how big the angel's fund is, how we make decisions, and if we've invested in this space before. Also, are you investing right now? I like those kinds of questions because it shows the entrepreneur is sizing me up and is interested in finding the right fit, not just someone to write a check. They want to make sure this match makes sense so they aren't spinning their wheels. Entrepreneur: What should an angel investor offer besides money? Cohen: They should make introductions for you to other investors, customers and partners. They should be asking you what your issues are and how they can help. With my companies, if I know what your top three issues are on a regular basis, I'm happy. Entrepreneur: What are the most important things you want entrepreneurs to tell you about themselves? Cohen: I want to understand the team and what makes it the right team. How did they meet, how do they know each other, where did they get this idea, what are they passionate about? I want to know how they think about that stuff, and I want to see the dynamic between them. The longer they've worked together and the more they've worked together, the better. I've seen teams that work well on paper but didn't work well together in reality. The most important thing to remember as you approach an angel is: Make it personal and passionate. It's not just about the business. Angles look at the team and consider how they feel about the team and then they ask: Will the business idea work? Related: Do You Believe in Super Angels? Entrepreneur: Your book criticizes angel networks for being too social and not serious about finding good investments. How do you tell the difference between a serious angel group and a social club? Cohen: You have to ask questions. You should ask for the names of the last four companies that members have invested in, and go talk to those entrepreneurs. If they won't talk, that tells you that this is a bad angel group. If they do talk, ask questions that will get beyond the general, "Yeah they're fine," comment and tell you how the angels support their start-ups and what they're like to work with. Entrepreneur: It can be hard to find angels, especially if you don't live in tech hub. Can you tell me how one of your investments came to you? Cohen: Some come through TechStars. But Danny Moon at Upnext tweeted me and started a relationship that way. He knew I had a background in what he was doing. His approach was very much: There is a reason I want to talk to you, I'd love your input. At one point, we were both in San Francisco randomly. He tried to set up a coffee and I said, "I'm really busy but maybe we can go to the airport together." So he gave me a ride to the airport and pitched me on the way. Entrepreneur: This is the question that all entrepreneurs want an answer to. What portion of a company should they be ready to give up to angel investors? Cohen: It depends on the amount you're raising, the experience of team and progress you've made. Upnext has been around for a few years, and it's just getting to the point where the founders need angel money. I would say 5% to 40%. Even 40% is high. The rule of thumb is 20% to 30% for every round. Most angels reserve at least one double down, that is, they set money aside to invest during subsequent investment rounds. Be wary of angels who want half the business or a majority stake. They're not experienced enough to know that they have to create ongoing upside economics for you. But no matter what portion of the company you're handing over, it comes down to the same thing: Will you get more value from the angels than what you're giving up?